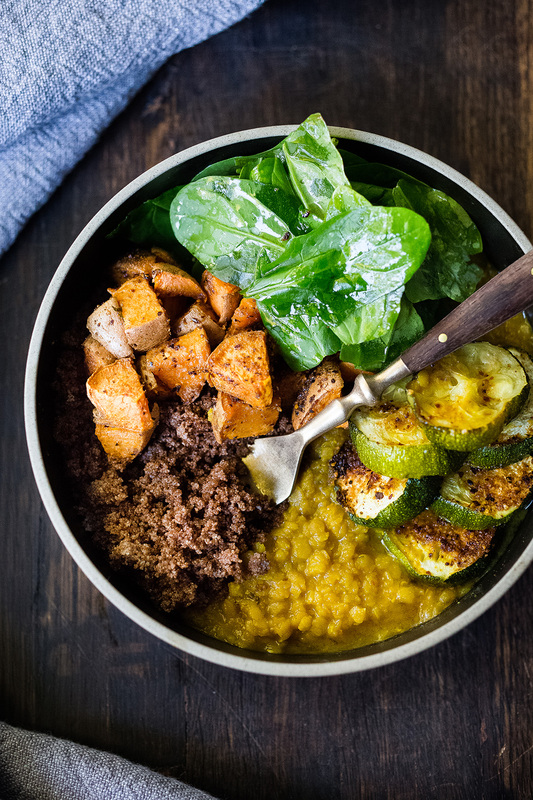 An Ethiopian-inspired bowl featuring whole-grain teff, seasoned lentils and roasted berber-spiced veggies, that is full of flavor and protein. Vegan and gluten-free. In a small pot add lentils, water, salt, onion powder, garlic powder, berbere spice and olive oil. Bring to a simmer, cover and continue simmering on low heat for 15-20 minutes, until tender, but intact. In another small pot, sauté teff in olive oil for one minute then add water and salt. Bring to a simmer, cover and cook on low heat for 8-10 minutes, or until water is gone. Fluff with fork, cover and let sit until ready to serve. While the lentils and teff are cooking, roast the veggies. Place the veggies on a parchment-lined sheet pan, drizzle lightly with olive oil and sprinkle with salt and berbere. Roast 20 minutes or until tender. Divide the teff and lentils between 3-4 bowls. Top with the veggies. Serve with baby spinach and optional Ethiopian yogurt. To make Ethiopian yogurt, simple add berber spice to taste, to plain yogurt.